On Sunday May 15th, 2011, one week before the municipal elections that were taking place all around the country, there was a grassroots-organized march in many cities in Spain under the motto “Real Democracy Now” (Democracia Real Ya[ref]Democracia Real Ya was not only the motto, but also the citizen platform to deepen in democratic values http://democraciarealya.es[/ref]). By then, I was living in Boston and closely following all these events through the Internet. Tens of thousands of people throughout Spain marched on the streets during what later would be known as #15M, the #SpanishRevolution or the ‘indignados’ movement. The movement was inspired by the Arab Spring and the Icelandic Revolution and was preceded by previous social mobilizations in Spain. The country was in the midst of a huge economic crisis and suffering from austerity measures that were dismantling the welfare state. The crisis was related to the world economic recession and to the bursting of the real estate bubble. In the short term, this new mobilization was related to #nolesvotes[ref]#NoLesVotes (Do not vote for them) was the hashtag used in Twitter to promote this cyber movement. First used against the “Ley Sinde” law (Ley de Economía Sostenible [Sustainable Economy Law], March 2011), which opened the possibility of Internet censorship. That led to a second stage of the online movement that urged a change in the electoral system to fight bipartisanship, “Do not vote for them” was their motto, referring to the parties that approved the law. “Les” also meant “Ley de Economía Sostenible.”[/ref], a mobilization launched and forged on the Internet against Internet censorship that a new law was enforcing. In the years before, there had also been other mobilizations similar to the Democracia Real Ya platform involving demonstrations on the streets throughout the country, among others: Juventud sin futuro[ref]Started in Madrid in February 2011, “Youth without a future” is a citizens’ platform to address the problems of the precarious situation of the youth during the economic crisis juventudsinfuturo.net. [/ref], to protest the precarious situation of the youth; Por una vivienda digna[ref]Started in Madrid in 2003 during that year’s real estate bubble, “Right to housing” is a citizens’ platform to address housing problems viviendadigna.org. [/ref], a citizens’ platform created during the real estate bubble crisis to address housing problems. I published a blog post about this case study that garnered a lot of attention in the social media sphere (Twitter). It is worth mentioning that El Mundo published a piece on this research: “El Mundo, the newspaper that covers all corruption cases” in a four-column headline[ref]“A study by the prestigious MIT in the US shows that this newspaper stands out in the Spanish press for investigating the political parties without exception”. . [/ref]. 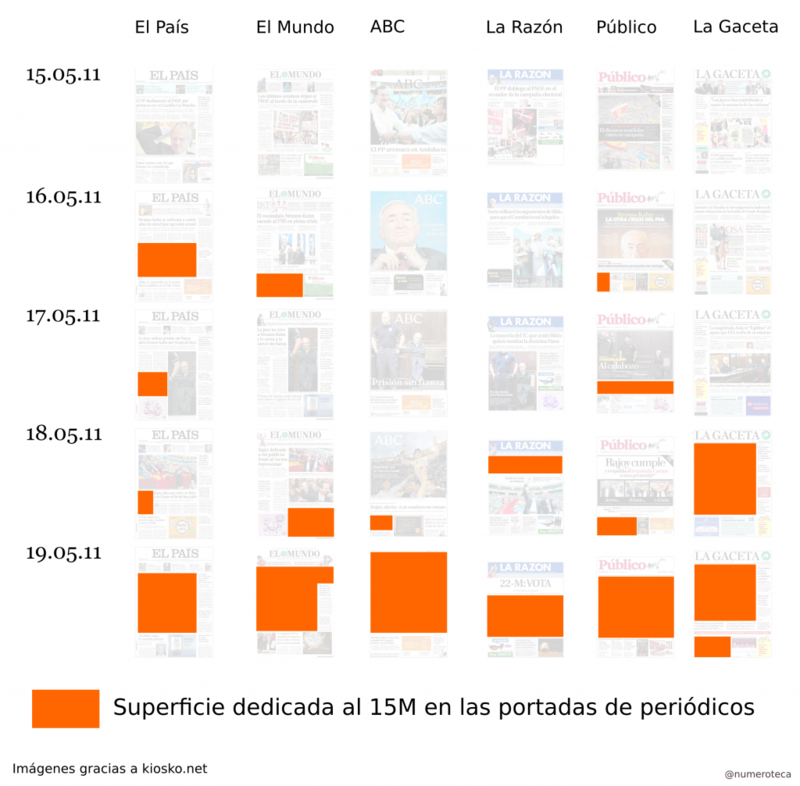 They were interested in showing how the data visualization supported their unbiased work, and redrew the graphic to show El Mundo in first place. In Spain, mass media are usually blamed for maintaining and supporting the bi-partisan system[ref]PP-PSOE, both parties are the ones entangled in more corruption cases; check the Corruptódromo map.[/ref]. This time, however, some newspapers were playing a fundamental role in unveiling corruption cases, but most of them only kept reporting about certain corruption scandals. Only a well-informed citizen who escapes the biased point of view of his/her reference newspaper can get the full picture of what is happening and react accordingly. 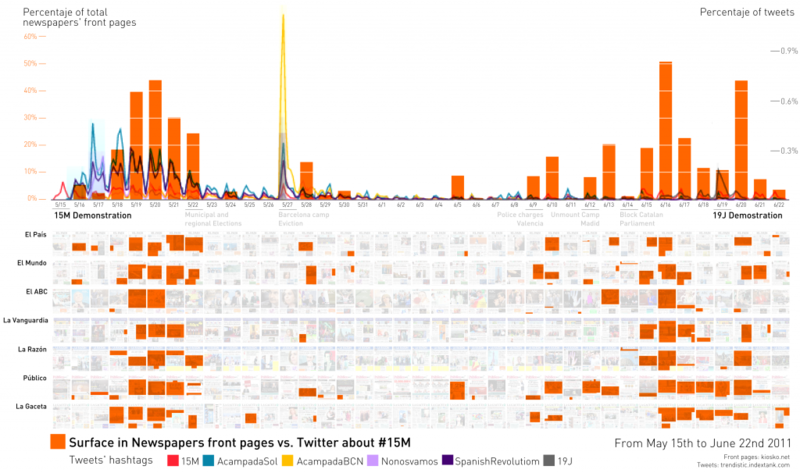 The method for analyzing newspaper front pages that we have described here, as well as the PageOneX.com platform, provide a straightforward way to analyze and visualize news attention to specific stories over time, across or between newspapers. In the future, we imagine either extending this tool or connecting it to others focusing on other media platforms, such as TV[ref] Archive.org is making the TV searchable by recording TV images and captions in a public archive: http://archive.org/details/tv . [/ref] and radio broadcasts, or to the online versions of newspapers and social media. I finally installed the PageOneX real size project with stories related to guns, wars and terrorism. 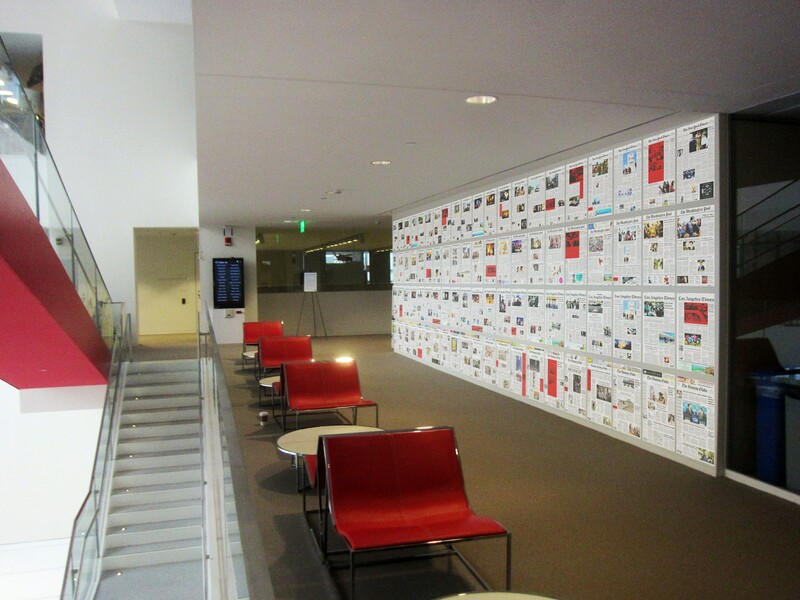 Come visit the display this week to the second floor of building E14 at MIT Media Lab. Thanks all of you that helped in this process: Adrienne, Luis, Álvaro, Nacho and Matjaz! After the post Guns vs Sports vs Wars I wanted to test news by location: local, for news related to the city or region where the newspaper is published; national for US news; and continent (as Ethan suggested). This visualizations fits pretty well with the previous one, as it fills the gaps of the more locally oriented newspapers like The Boston Globe and LA Times. I do not think I will use this approach in the final PageOneX real size version, but it is interesting to view the same newspapers coded by different ways. I can imagine a par of special glasses that would allow the viewer shift from one visualization to another. Note: I have only coded the main news (only the big ones). 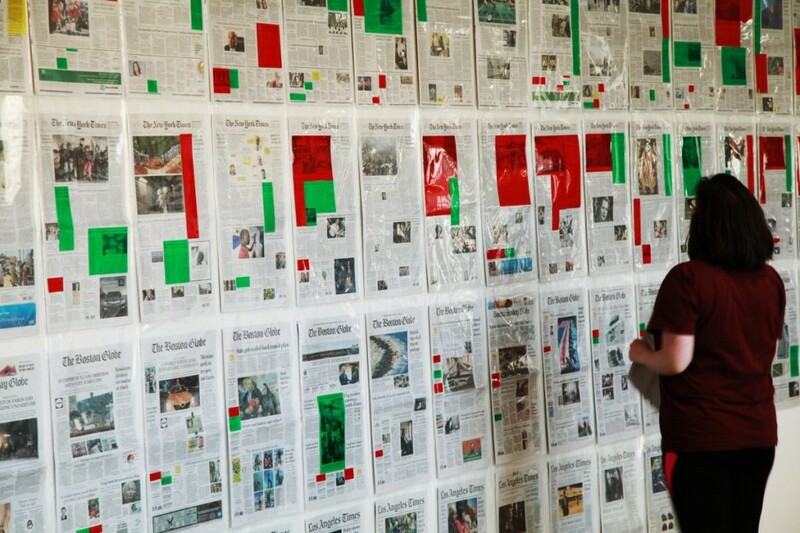 I am preparing a project for a physical display of a PageOneX visualization at the MIT Media Lab Festival for April 2013. I blogged about it and also gathered some references about front pages in art and cinema. We’ve opened (with Rogelio López) a section of the website to gather articles and books related to front page analysis. 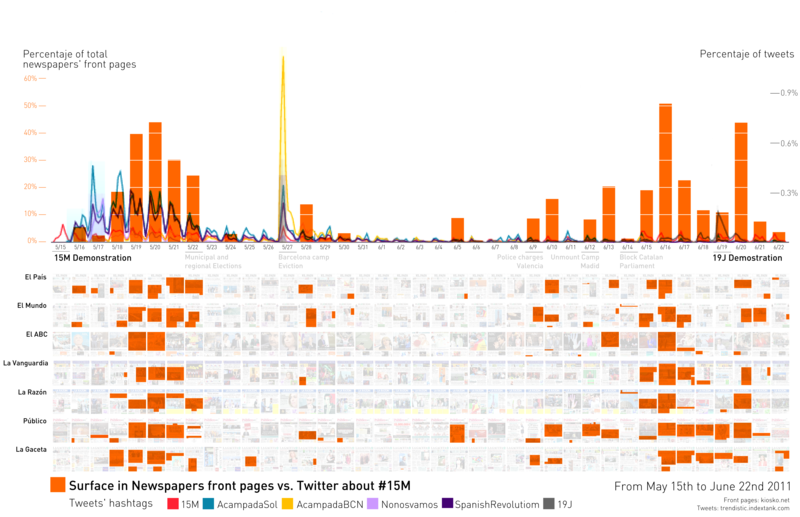 Help us get more examples of front page analysis! Testing a new way of visualizing all the threads. I hope that by late April we’ll have a new version of pageonex.com available. You can check all the things that we are fixing or suggest yours. Meanwhile you can use the buggy alpha version or install it in your own computer.